What is the Maine Outdoor Heritage Fund? 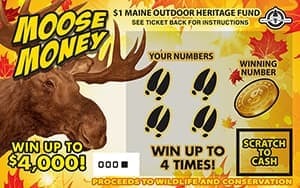 The Maine Outdoor Heritage Fund (MOHF) conserves wildlife and open spaces through the sale of instant, scratch lottery tickets. With proceeds from ticket sales, grants are awarded twice a year, totaling approximately $700,000 annually. Grant application deadlines are March 1 and September 1 of each year. The seven-member Maine Outdoor Heritage Fund Board chooses projects in four categories that promote conservation of Maine's fish and wildlife habitat, acquisition and management of special places, endangered species, and conservation law enforcement. The Maine Outdoor Heritage Fund has been helping to fund critical wildlife and conservation projects throughout the state since it was created by the Maine Legislature in 1996, in response to a grassroots effort from environmental and sportsman's groups. Supported through proceeds from the Maine Outdoor Heritage Lottery Ticket, MOHF finds its funds lagging while grant proposals continue to pour in. Please help us spread the word about the MOHF scratch lottery ticket. The more tickets that are sold, the more projects can be funded! Only the MOHF lottery ticket helps fund projects in our state to secure Maine's outdoor heritage for future generations. Tickets are available at most convenience stores, gas stations, and other outlets where Maine State Lottery tickets are sold. Find a local sales agents (PDF) If you don't find it in your favorite store, please ask the owner or manager to carry the MOHF lottery ticket and let them know of the great projects the MOHF ticket funds. Also, agents get an additional commission on their MOHF ticket sales! For more information about the Maine Outdoor Heritage Fund and the Maine Outdoor Heritage Lottery Ticket, contact Carol Gay, Secretariat for MOHF, email: mohf@gwi.net, or (207) 458-8421. MOHF grant proposals must meet the Guiding Principles for the Maine Outdoor Heritage Fund found in the MOHF Strategic Plan (PDF). Only designated qualified sponsoring agencies may submit a proposal for a Maine Outdoor Heritage Fund Grant; therefore, grant applicants must submit proposal applications through a qualified Sponsoring Agency. Grant Applicants must review the MOHF Grant Application Requirements (PDF) prior to submitting a grant application and obtaining sponsorship from a Qualified Sponsoring Agency. Proposal applications are reviewed and awards determined at the MOHF Board meetings which are generally held approximately the first week in November for the fall grant cycle and the approximately the first week in May for the spring grant cycle. Before applying, applicants should discuss their proposed projects with Sponsoring Agency to determine appropriate sponsorship and deadlines. January 15 (Spring Round) & July 15 (Fall Round): Grant Applicant to contact Sponsoring Agency Rep.
February 1 (Spring Round) & August 1 (Fall Round): Grant Applicant to submit one-page Summary Application Form (PDF) to Sponsoring Agency Rep.
February 20 (Spring Round) & August 20 (Fall Round): Grant Applicant to submit 10 copies of the full proposal and one copy of Summary Application Form (PDF) to Sponsoring Agency Rep.
March 1 (Spring Round) & September 1 (Fall Round): Sponsoring Agency Rep will submit nine copies of the full proposal and nine copies of signed Summary Application Form to MOHF. All MOHF Board Meetings are open to the public and grant applicants are encouraged to attend. Concerned about a lack of funding for projects that conserve the outdoors for Maine people and wildlife, the Sportsman's Alliance of Maine and the Maine Audubon Society joined forces in 1994 to address the problem. Their referendum campaign to establish a Lottery ticket dedicated to conservation was so successful that the Legislature implemented the program on its own, bypassing the need for a referendum. Since tickets first went on sale in January, 1996, over $20 million in grants have funded over 1000 projects. The Legislature created the seven-member board with three permanent members: the Commissioner of Conservation, the Commissioner of Inland Fisheries and Wildlife, and the Director of the Natural Areas Program. Four citizen members are appointed by the Governor to staggered terms: one from a state sportsman's organization, one from a state wildlife conservation organization, and one working in a field related to natural resources. To view Microsoft Excel files, you will need the free Excel Viewer.